Figure 1. Atomic force microscopy and correlated optical spectroscopies can yield information about the sample composition (here a cross section of some food packaging material), shape, and various other properties, such as nanomechanical maps and thermal property maps. The desire to identify materials and their properties to understand complex systems and better engineer their functions has been driving scanning probe microscopies since their inception. 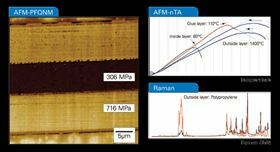 Both atomic force microscopy (AFM) and Raman spectroscopy are techniques used to gather information about the surface properties and chemical information of a sample. There are many reasons to combine these two technologies, and this application note discusses both the complementary information gained from the techniques and how a researcher having access to a combined system can benefit from the additional information available.